For the golf genre, see Category:Golf. Golf was the fourteenth game that Nintendo released for the Famicom. It was the number one selling Famicom game released during 1983 and 1984, selling approximately 2,460,000 copies in its lifetime. 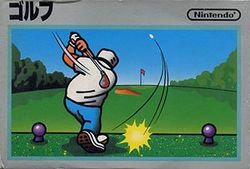 It was the first golf game for the NES. It was released in arcades as Vs. Stroke & Match Golf as part of Nintendo's Vs. arcade system. The arcade game was released as two different versions, a "Men" version and a "Ladies" version. Golf was re-released for the Famicom Disk System, and later as a set of e-Reader cards for the Game Boy Advance. This page was last edited on 26 September 2015, at 04:58.